Andrew Steer, WRI’s President and CEO, is in Brazil for the Mayor’s Summit and Congress this week. Here he answers four questions about the event and his expectations for it. 1. More than half of world’s population now lives in cities, where emission levels and stress rates are the highest. What can city leaders do today to mitigate climate change? Andrew: Any solution to global climate change must put cities at its core. Cities today produce 75 percent of the world’s carbon pollution. But they are also centers of economic activity, innovation and creativity. City leaders can do many things to drive down carbon emissions. Fortunately, these actions are also just good ideas to improve city design and efficiency. First, cities need to measure their carbon greenhouse gas emissions every year. They need to have a plan to reduce their carbon emissions and they need to have a clear set of actions that would help to reach their target. They need to publish their results each year, allowing the public to know if they are making progress. They can immediately put in place new building codes, and immediately start switching from private, car-based transportation to public-based transportation. Then, they will very quickly look again at their energy mix. They will start to demand more renewable energy, shifting away from fossil fuel energy that leads to air pollution and causes health problems that drain productivity. City leaders can start today. And many mayors are doing just that. 2. Most developing countries, including Brazil, face difficulties in bringing people, municipal managers and other stakeholders together to work for a better urban future. What do you believe is the first and most important step to break down these barriers to positive urban change? Why? Andrew: It seems to me that the starting point is to ask citizens: Are you happy with the way that life and the economy of the city work? Are you happy with the fact that we lose productivity due to congestion, and more income is lost to air pollution, which also makes people less healthy? Are you happy that it takes people two, three or more hours to get to work and that this eats away at income? The former Mayor of Curitiba Jaime Lerner has said that if you can set a clear vision of where you want to go, are able to communicate with your citizens and have a decent ability to implement your actions, you can change a city’s direction in the political lifetime of a mayor. 3. WRI’s long-term goal has been to turn ideas into action for a more sustainable world. To this end, what are the main goals and opportunities for WRI Ross Center for Sustainable Cities? Andrew: WRI’s focus on sustainable cities draws on the foundation of its urban mobility program, EMBARQ. For more than a dozen years, WRI has had staff on the ground in cities in Mexico, Turkey and Brazil, and we have worked with city leaders for success. EMBARQ has been a creative force for clean and healthier transport options, like the bus rapid transit systems that now operate in more than 160 cities. Recognizing that cities are the heart of today’s sustainability challenges, we are building on our mobility work to look at entire cities. This includes looking at urban form and land use planning and understanding the connections between fiscal policy and governments at the local and national levels. We also have improve water and energy systems. We understand that in order to create sustainable cities of the future, we need to look at cities in a holistic way. That’s what WRI Ross Center aims to do. We want to build upon the deep expertise we have in transport and the growing understanding of urban design to help city officials create cities that are better for people. We want cities that are compact, connected and efficient. We are identifying new approaches and then we are working with local partners — in government, the private sector and civil society — to bring urban solutions to scale. 4. The Mayors Summit and the Cities & Transport International Congress will gather public managers, decision-makers, technicians and NGOs to discuss ways to turn ideas into action. What are your expectations of these events? Andrew: Brazil brings together all of the opportunities and challenges of urban development. Yes, you can have urban poverty and unrest. But you also find the vibrant hubs of creativity and innovation and vision. The Mayors Summit and Congress will bring together city leaders and officials to explore the ideas that are at the heart of sustainable urbanization. We will engage in vigorous discussion, uncover new ideas, as we bring together many of today’s top urban thinkers in Brazil and around the world. These events also offer an opportunity to highlight the tremendous contributions of EMBARQ Brasil, which has become one of the most recognized and respected actors in urban mobility in the country and beyond. 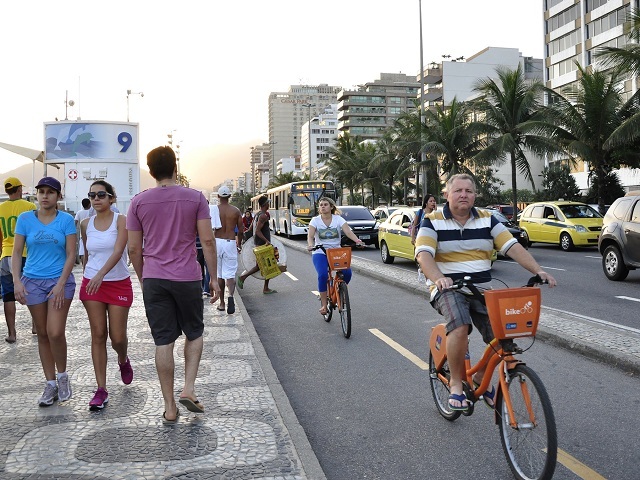 Over the past decade, EMBARQ has embraced the challenge of urban mobility and now, combined with our staff in WRI Brasil, this organization is looking to take the next step to tackle sustainable cities. Our Brazilian team has done the hard work in organizing the Summit and Congress. I’m just happy to play a small part in what will be an extraordinary few days focused on creating sustainable cities. For a recap of the Mayors’ Summit, click here.